1/4 LB. OF ITALIAN GRAN TRONCONI MILLEFIORI WHICH IS JUMBO SIZE! THERE ARE APPROXIMATELY 14 PIECES PER 4 OZ. (1/4 LB.) BAG. THEY CAN RANGE FROM 1/2" - 1"+ PIECES. NOTE: THE FACE OF THE CUT JUMBO MILLEFIORI HAS A HAZY LOOK DUE TO THE SAW THAT IS USED DURING THE CUTTING OF THE MILLEFIORI. 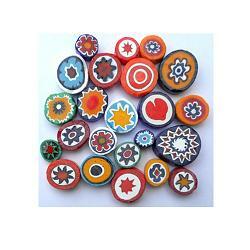 TO OBTAIN A SHINY SURFACE YOU CAN FUSE, MELT, TUMBLE OR USE A SEALER ON TOP OF THE MILLEFIORI. WE HAVE EVEN USED MINERAL OIL, BABY OIL AND MAC GLUE TO OBTAIN A SHINY SURFACE. YOU CAN ALSO PURCHASE OUR MELTED MILLEFIORI IN WHICH THE HAZY SURFACE HAS BEEN ELIMINATED.